Terry Turrell Painting "10 Steps From Where You Stand"
Terry Turrell shares his home with cats and dogs which he cares for with diligence since his wife passed away. They are like his children often acting as his models in the studio. This painting has an unusual chalkboard background that is indecipherable. Painted on a wood panel. 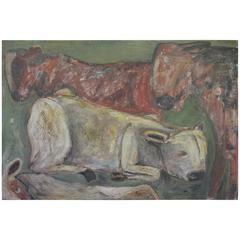 An earlier painting by Terry Turrell picturing the cows resting in a field. This would be inspired from his time in rural Idaho where he grew up and visited his family. 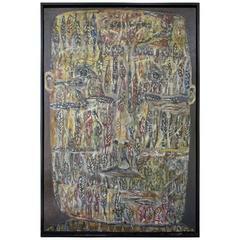 Painting by Terry Turrell on wood panel. This painting is from an earlier series of paintings of heads. Terry Turrell painting on panel with metal tube edging painted. Terry is a self taught artist living in the North West who often includes the animals he lives with in his paintings. 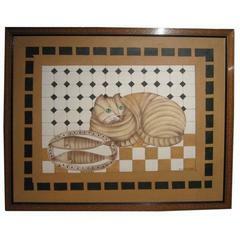 Signed stylized oil painting of a cat in a hand-painted frame. 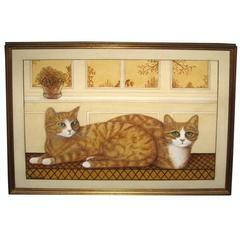 Oil painting of cats in giltwood frame signed Kenney Hampton location. 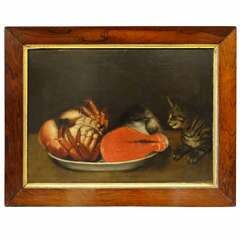 Mid-19th century oil on canvas of cat eyeing uncooked seafood. 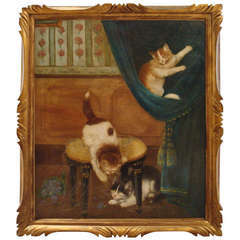 1850s European painting of family with cat. Unsigned. Wood and gesso frame. 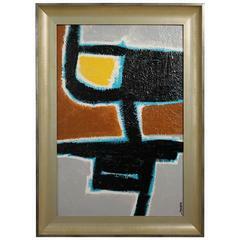 Ken Joaquin Original Abstract Oil Painting "Cat"